The OLED-embedded fingerprint technology for Apple's "iPhone 8" is "still being worked out," an analyst claimed on Wednesday, with the company only deciding on one of three options by the end of June. The one settled point appears to be that there won't be a sensor on the back of the phone, Cowen and Company's Timothy Arcuri indicated in a memo obtained by AppleInsider. The three options include thinning the cover glass over a sensor area, creating a pinhole through the glass for an optical or ultrasonic sensor, or trying a "film" sensor integrated into the display, using either capacitive or infrared technology. Regardless of which route Apple chooses, there will probably be a one- to two-month delay for the "iPhone 8," Arcuri wrote. As such the analyst is leaving the product out of a forecast 46 million iPhone sales in the September quarter —below a Wall Street concensus of 47 to 48 million. The company could potentially sell 90 million units in the following holiday quarter, he estimated. Arcuri was less certain about the prospect of an "iPhone 7s" and "7s Plus," and noted that their launch might boost sales numbers in the September period. Rumors have suggested the devices will stick to 4.7- and 5.5-inch LCDs, as well as physical home buttons, but get some features of the "iPhone 8" such as wireless charging. 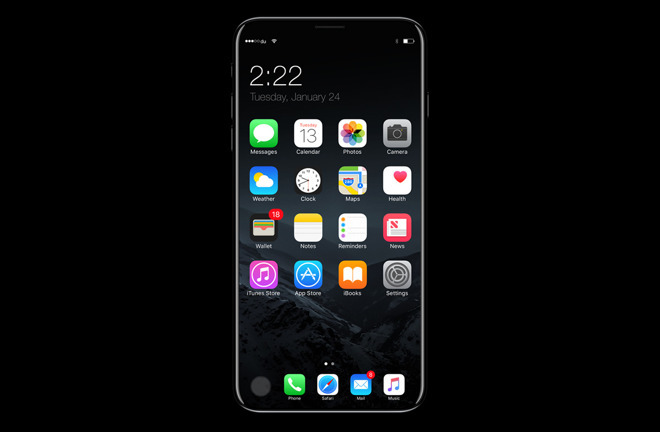 The "iPhone 8" is typically expected to use a 5.8-inch, edge-to-edge OLED display, reserving about 0.7 of that for a virtual home button and/or other controls. It should also have a vertically-aligned, dual-lens rear camera, and on the front sport sensors for 3D facial recognition. Arcuri is continuing to maintain an "outperform" rating for Apple stock, with a $160 price target. September quarter revenues are predicted to hit $49.5 billion, about $1 billion below Wall Street consensus.